Adam Gledhill suffered an ACL injury during the Bulldogs victory over Barrow which could see him miss the rest of the season. Picture: Paul Butterfield. Batley Bulldogs coach Matt Diskin fears prop forward Adam Gledhill could be ruled out for the season after suffering an ACL injury during the side’s 32-12 win over Barrow Raiders a fortnight ago. Gledhill, who has been in fine form in the early part of the season, limped off against Barrow and the injury appears to be worse than first thought. Batley have played just three of their scheduled five Championship games so far after last week’s clash with Halifax was postponed due to heavy snow. No new dates for the Halifax game, or the Rochdale match postponed on the opening day of the season, have been arranged as the Bulldogs now turn their attentions to a tough trip to London Broncos on Sunday. London have started well, winning all four games, and Diskin knows his side face a tough trip against another full-time outfit. The Bulldogs coach added: “London have started really well and it will be tough going into the game as we have not had any consistency. 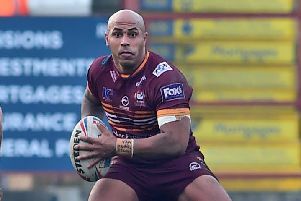 London are coached by former Leeds and Castleford forward Danny Ward — son of former Batley coach David — and are riding high in second place in the early Championship standings. Diskin added: “Danny has been academy coach for the last couple of seasons and has got some really talented kids who he is giving a go. Sam Smeaton is around a week away from full fitness but Joel Farrell is available after serving his suspension, while Diskin has not ruled out signing a replacement for Gledhill should the right player become available. Centre Lewis Galbraith has extended his contract with the Bulldogs until the end of the 2019 season. Galbraith joined Batley from Rochdale for the start of this year and bagged a brace of tries in the 48-28 win over Swinton Lions on February 18. The official Batley Bulldogs Supports Club are running a coach to London, picking up at Birstall Library (8am), Branch Road (8.10am) and Mount Pleasant (8.20am). The cost is £25 adults, £15 juniors and seats can be booked via Station Coaches on 01924 477230.